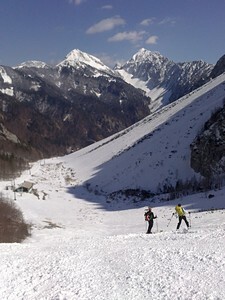 Zelenica has 20 hectares of skiing and snowboarding terrain serviced by 5 lifts, spread across the Karavanke Mountains. Due to its shaded location, late skiing is sometimes possible at Zelenica and the surrounding peaks offer excellent ski touring opportunities. The nearest airport to Zelenica is at Ljubljana.